The barriers to hub price penetration in the Asian LNG market are crumbling as trading liquidity & shorter term contracting grow. Have you heard the following arguments? The same arguments were made in Continental Europe 15 years ago and the UK in the 1990s. And they were wrong. Gas on gas competition will evolve differently in Asia to Europe. But there is already a quiet revolution underway supporting the growing influence of hub pricing in the Asian LNG market. Asian portfolio evolution and a ramp up in US export volumes is driving an increase in spot and shorter term contracting of LNG. Market liquidity is being reinforced by growth in the activity of commodity trader intermediaries. European hubs are already the key reference price benchmark for shorter term LNG deals in Asia. But a more active Asian spot market is evolving with price formation based on prevailing regional market fundamentals. As liquidity is improving it is paving the way for a truly Asian price signal. In today’s article we look at three drivers that will continue to support the increasing influence of hub pricing in Asia. The need to clear portfolio imbalances is a primary driver of spot trading. There are some pronounced imbalances in Asian LNG portfolios over the next 5 years. Japanese and Korean utilities are over-contracted, driving short term contracting to reduce portfolio length. On the other hand, many emerging Asian buyers are under contracted with a requirement to make up volumes via shorter term purchases. In addition, low volumes of domestic storage create a requirement for balancing via short term LNG purchases e.g. in China. The rapid pace of ramp up in new global LNG supply from 2018-20 also supports increasing shorter term liquidity. These factors are combining to create a growing structural requirement to transact cargoes which is helping boost the relevance of regional spot price markers. Portfolio imbalances are providing a clear motivation for Asian LNG players to develop stronger trading & optimisation capabilities. This is reinforced by the requirement to hedge and optimise US export contract volumes against prevailing market prices. Japanese utilities in particular have been active over the last 12 months in expanding their trading presence in both Asia and Europe. The other shot in the arm for traded market liquidity is coming from commodity traders. Companies such as Trafigura, Vitol, Glencore & Gunvor are applying expertise developed in the oil market to support expansion of their LNG midstream & trading presence. As intermediaries, the business model of commodity traders strongly relies on hub price signals. By transacting between producers and buyers they are boosting both hub price penetration and LNG market liquidity. 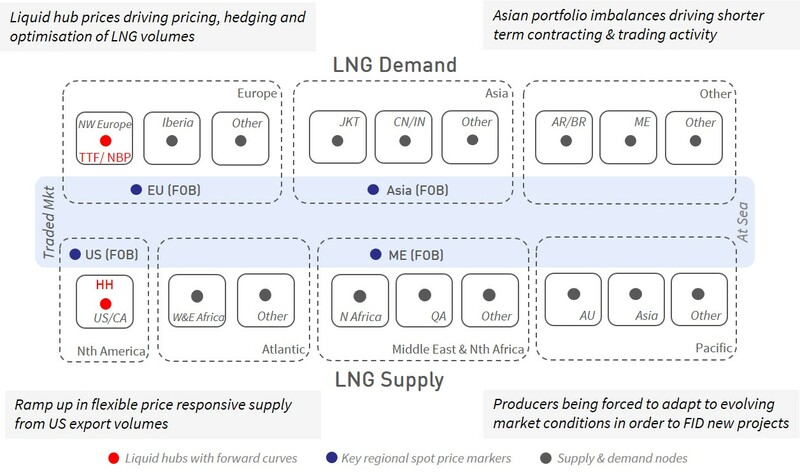 The evolving dynamics around LNG traded market growth are summarised in Chart 1. European hubs already act as a strong marginal price signal for the LNG market. The prices of short to medium term LNG contracts are typically priced at a basis to the TTF/NBP hub price alternative. This is reflected in the clear relationship between Asian spot prices and TTF shown in Chart 2. LNG supply contracts which have delivery flexibility are being optimised against spot price signals. And rapid growth in US export contract volumes will reinforce this, with forward exposures hedged against TTF/NBP and delivery optimised against regional spot prices. A pricing basis for short to medium term transactions. 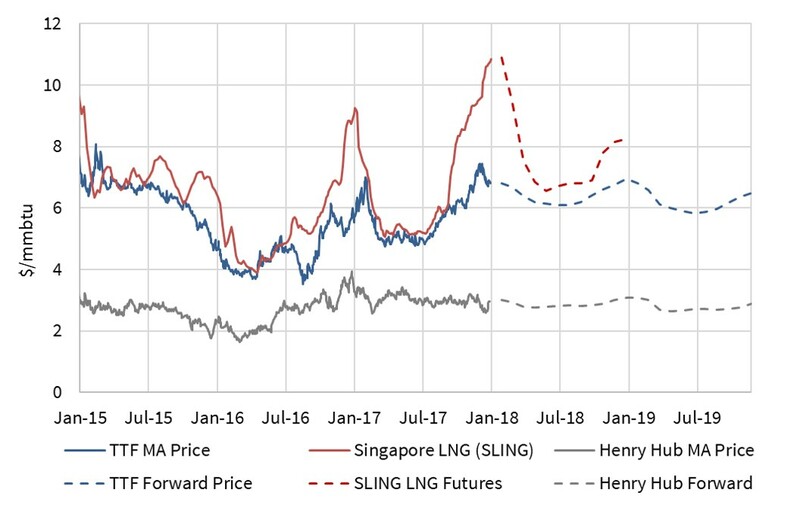 The development of a ‘triangle’ of price references – Henry Hub, European hubs and Asian spot LNG – provides the necessary guidance for market development as LNG volumes ramp up. The factors above are driving a virtuous cycle supporting the strengthening influence of hub price signals on the Asian LNG market. Hub price penetration will not wait for the end of oil-indexed contracts and an established Asian hub. It is here already.